Zerynth App is a mobile application for Android and iOS that allows fast prototyping of graphical interfaces for your IoT projects. With Zerynth App you can turn any mobile into the controller and display for smart objects and IoT systems! In particular, you can manage and control the connected devices programmed with Zerynth, enabling a bidirectional communication channel between them and your mobile. In this tutorial, we’re going to see how to develop a simple but powerful IoT Thermometer, using a Zerynth-powered single-board microcontroller and Zerynth App as the remote display. First of all, you need a board. You can select one of the 32-bit microcontroller devices supported by Zerynth. We’ve chosen the Flip&Click by Mikroelektronika, that shares many of the same attributes as the popular Arduino platforms, including the 32-bit AT91SAM3X8E by Microchip, the core of Arduino Due. To measure the temperature we’ve picked the Temp&Hum Click, that carries an HTS221 temperature and relative humidity sensor. To connect the board to internet we’ve chosen the WiFi PLUS Click, that features MRF24WB0MA – 2.4GHz, IEEE std. 802.11 – compliant module from Microchip, as well as MCW1001 companion controller with on-board TCP/IP stack and 802.11 connection manager. Zerynth Studio, our powerful IDE for embedded programming in Python that enables the IoT. You can download it here. Zerynth App. You can download it here. Flip&Click is Arduino’s two-sided cousin. On one side it’s an Arduino. But on the other side, you’ll find four open mikroBUS sockets for what the company calls “click boards.” Essentially, these are add-on modules that resemble Arduino shields, but shrunken down so that you can fit a few at the same time on the Flip & click without any trouble. Just add the Temp&Hum and the Wifi Plus clicks to the board, respectively at the slot A and B. Once you have installed Zerynth Studio and created a Zerynth user, you can clone the example “Zerynth App Oscilloscope“. Take a look here to learn how to clone an example. Let’s take a look at the original code in the “main.py” file: here is where you develop the logic of your Python script. We’ll start from the original code and then we’ll edit the script to develop our specific project. # Start the Zerynth app instance! In this simple example, a graphical oscilloscope is visualized by the Zerynth App with data coming from the connected board. Data are acquired from an analog sensor by the “analog” pin A4. Now we have to create a “connected device” and link the “zerynthapp” instance to it. Below you can see some screenshots with the necessary steps. Take a look at this doc for more technical details. The device credentials (UID and TOKEN) can be copied and pasted directly from Zerynth Studio (ADM panel). “IP” is the ip address of the Zerynth ADM. This argument is used when the network driver does not support hostname resolution, as in this case. Templates can be added by clicking the respective “plus” icon. Then upload the template from the dedicated folder. Note that the file where the template is defined is called “index.html” and you can edit it how you want. In this case, you can leave it as it is. Remember that “DEVICE UID”, “DEVICE TOKEN”, “SSID” and “PASSWORD” have to be edited to fit with your own parameters. At this point, you can uplink the script into your device. 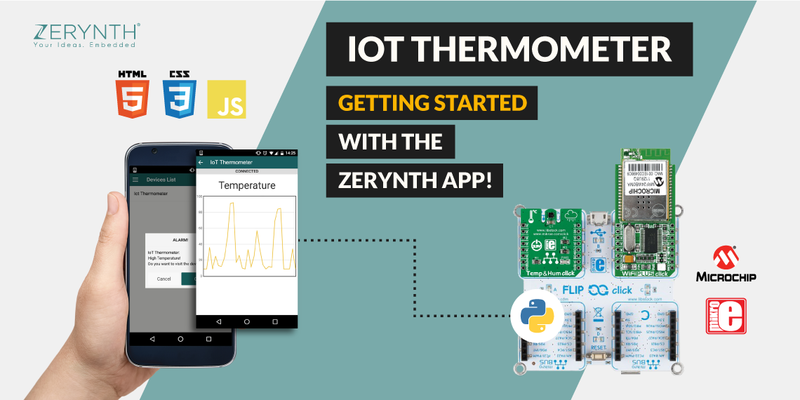 As you can read in this very brief tutorial, you have just to open the Zerynth App, log-in and select the specific device to see your IoT Thermometer dashboard. Last, Zerynth App can also receive push notifications from the connected devices. In this case, a notification will appear when the temperature will be greater than the threshold! If you have any questions don’t hesitate to open a discussion in our community forum.